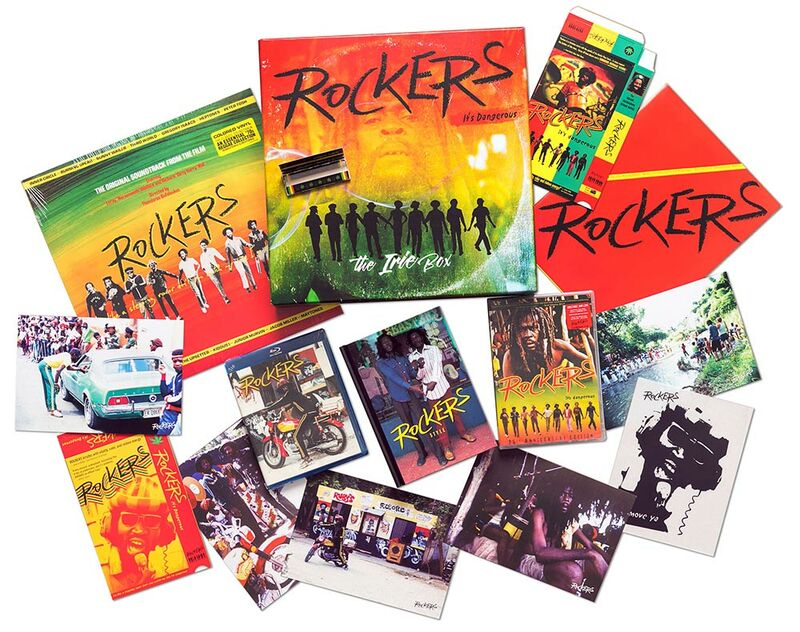 The 1978 classic Reggae movie Rockers gets a deluxe treatment with a massive box set. It includes the newly-pressed, original vinyl soundtrack of the film on red, yellow and green tri-colored vinyl. Also included is the film on DVD and Blu-ray, as well as a deluxe 384 page photo book, poster, iron-on t-shirt decal, rolling papers, postcards and various original VHS box covers. A collector's dream! The film captures Reggae at its musical apex with a vibrant and magnificent reggae soundtrack now digitally re-mastered from the original 35mm film made in 1978. A riotous burst of energy and colour, Rockers is a cameo-packed gutsy feature film of the dread-locked, ganja-smoking drummer Leroy ‘Horsemouth’ Wallace’s attempts to succeed in the cut throat Jamaican music biz which provides much insight, amusement and education. The cast reads like the ultimate Reggae Hall Of Fame, featuring some of the leading musicians and producers of the day: Peter Tosh, Gregory Isaacs, Lee Perry, Dennis Brown, Jacob Miller & Inner Circle, Bunny Wailer, Third World, Big Youth, The Heptones, Kiddus I, Robbie Shakespeare, Leroy Smart, Dillinger, The Maytones, Junior Murvin, Junior Byles and the awesome Burning Spear.